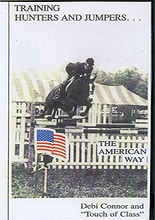 This DVD provides a step by step, easy to understand outline of training sessions taking the horse and rider from cavalletti rails rails to course work. The championship form and performance demonstrated throughout the series can easily be applied. Learn to jump with international jumper rider Debi Connor! This series teaches basic and advanced techniques, enlightening the non-riding viewers as well as professionals and hunters and jumpers. Debi Connor is a well known rider and trainer of hunters and jumpers. She has been instrumental in the training of some of the top mounts in the world.